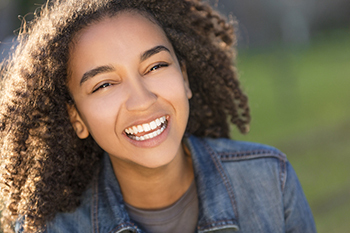 Capture your teenage memories with confidence and let Invisalign Teen in Williamsville, NY, Orchard Park, NY and Elma, NY, help perfect your smile! Invisalign Teen clear aligners are removable and virtually invisible, which means you can straighten your teeth without anyone noticing. You can still eat and drink what you want. Also, you can brush and floss normally to maintain healthy gums and teeth, and there are no wires or metal brackets to cause mouth abrasions. Invisalign Teen comes with a blue-dot indicator on each aligner. When you wear your aligner for 20-22 hours a day (as recommended), the blue dot will fade to clear to let you know when it’s time for the next set of aligners. At More Than A Smile Orthodontics, we know you have a busy schedule between school, chores, and extra-curricular activities. Our revolutionary Invisalign Teen in Williamsville, NY, Orchard Park, NY and Elma, NY, gives you one less thing to worry about during your high school days. Schedule Your Complimentary More Than A Smile Orthodontic Assessment for Invisalign Teen in Williamsville, NY, Orchard Park, NY & Elma, NY, Today! Do you want to learn more about Invisalign Teen? To find out if you are a candidate for this state-of-the-art orthodontic treatment, request your complimentary More Than A Smile Orthodontic Assessment. Your completely free, no-obligation assessment includes a complete exam, x-rays when needed, and a comprehensive treatment consultation with our expert orthodontist. Call 716.633.4747 or click here for an appointment today! Come experience More Than a Smile Orthodontics! You will quickly discover that we offer state-of-the-art and affordable Invisalign Teen in Williamsville, NY, Orchard Park, NY, Elma, NY, Amherst, NY, Clarence, NY, Tonawanda, NY, Hamburg, NY, East Aurora, NY, Lancaster, NY and West Seneca, NY – and we do it with a smile. We’re ready to help you achieve a healthy smile in less time!